We had a fairly uncommon case today. Like many others in the business we offer certain serviced boards for sale with a CORE option, i.e. option to give cash back for the old dud provided it comes physically good and without traces of tampering. This allows us to service it and put it back for sale, thus closing the revenue cycle. 3) Returned board may meet stated criteria (not tampered, not broken, returned timely), but for one reason or another we may fail to service and put back in use (e.g. if we can't figure what went wrong with it or if very specific part has failed that we can't find etc.). Any of those breaks our revenue cycle and we have to source a board - sometimes working one, which costs much more than what we'd earn on the first one of two repairs combined - that we can sell again and hope customer returns the old one for credit per our offering. 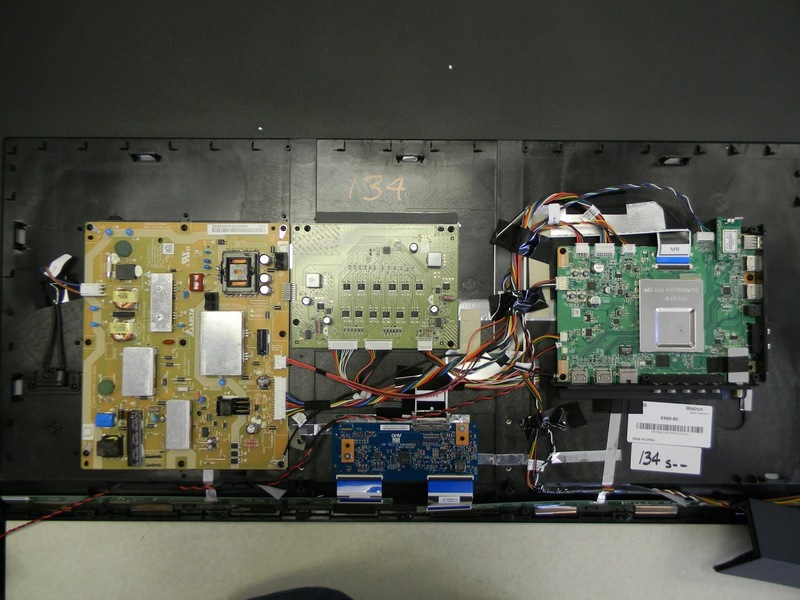 Today we had a situation we haven't had in quite some time, if ever: the return was not tampered with, it has failed electrically all right and is probably repairable...but is different version of the board. Case in point is about DPS-167DP used in Vizio E550i-B2 and DPS-146EP used in Vizio E480i-B2. So a buyer returned DPS-146EP in place of ordered and sent E550i-B2. "Dishonest seller, refused to honor replacement refund, insulted me instead". Now if anyone knows me from previous posts or otherwise they should already know I like facts. Just finished inspecting the board you returned to us for $45 credit. I am afraid we have a problem with it. The board we sent you was DPS-167DP and the board you returned to us is DPS-146EP. The difference is explained in the listings we have for both boards and is an important one since DPS-146EP can not substitute DPS-167DP, but the opposite is possible. Can you possibly shed some light on how come we get a board from a different TV model? I searched based on my model and ordered the indicated power supply. I received it. I removed my existing power supply and sent back the one that was in there to you for core refund. The one you sent works in my tv. I'm happy. I'll be completely happy when you reimburse me for my core charge as promised. By the way, as far as I could tell both boards looked identical, and it seems obvious the component that was damaged on my board was the component that was repaired on the one you sent to me. Glad you were happy with the board you received, but unfortunately we are not happy with the board we received. This is not an accusation in any way, this is statement of a fact, the cause of which is that, as stated, the two boards *are* different. The fact that they may look identical to you is irrelevant as it is subjective and ultimately we are the pros and not you. 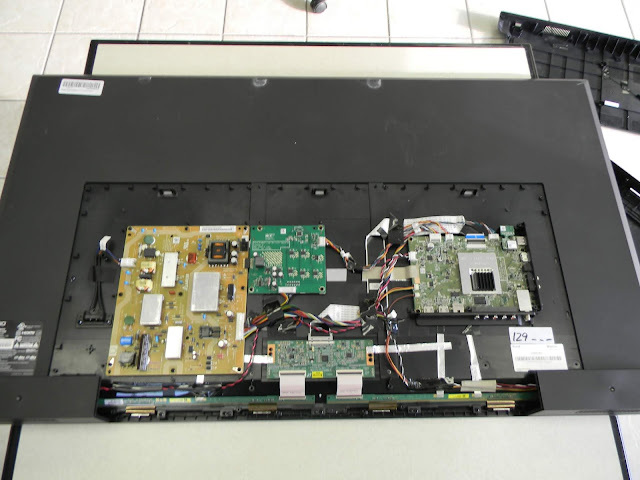 We delivered a board DPS-167DP for Vizio E550i-B2 as advertised and as explained in additional details in the listing. We got back board DPS-146EP, which is not an equivalent trade since we can't sell it to the next person with E550i-B2 as they may very correctly point out that it is not the same board; more importantly, DPS-146EP lacks connector CN201 by design whole E550i-B2 has it and most importantly the two can deliver different power to the LED driver. Which is why Delta has the separation in the first place. Do you want to restore status quo and you return our board to here for full credit and we return yours back to you untouched? We do not want to profit from this and we are ready to do what it takes to ensure you this is neither bait and switch nor picking up on a customer. It is apparent to us that the situation is not one a customer enjoys, but then again we have not done anything wrong to be on the receiving end. To you this transaction so far results in a working TV. To us it results in interruption of business cycle where we sell, receive back, repair and sell again. We need DPS-167DP that we can sell to the next customer and we did not get one back. Either you will need to return ours or we will need to buy one. I followed all your rules. I returned the board that was in my tv that was in your ad as being a replacement board. You know full well you will resell the board I sent you and make money off it. You're using some technicality to take advantage of me. Furthermore, you're also directing customers to your private, non-eBay site offering cheaper discounts and trying to direct e-commerce off eBay to private transactions, presumably where you can take advantage of more customers with less recourse. Refund my core fee as promised or I'll be filing a formal complaint and leaving negative feedback. I will also be posting much information publicly warning people about your dishonest and disreputable service. I SENT YOU THE BOARD BACK. It WAS THE SAME BOARD. It is unfortunate that you see crime and bad intents so easily and in conflict with common sense. There are so many indications of why this is not a cheap shot at your money - from the fact that there were so many satisfied customers before you through the fact that we never asked anything from you to our offer to give you full refund to restore status quo. Yet you accused us and threatened us. We elevated the case you opened on PayPal so they decide. We'll abide by their decision, whatever it might be. Again we were discussing a problem and never made neither accusation nor a demand - we merely stated facts. Took me a while...but I found illustration of why DPS-146EP can not be used to substitute DPS-167DP. The attached picture 00134-03.jpg shows M550i-B2 as identified by the label. If you zoom the picture you will see the number on the board there marked - DPS-167DP. Attached picture 00129-03.jpg, on the other hand, shows E480i-B2 using DPS-146EP. The two boards look similar, as you properly note, but they are different, as I also properly pointed out. If you look closer you will find one extra connector on the 55'' power board. It is closer to the largest connector that goes to the power. We do not want to tell you what was in your TV; we wanted to know how come we received board that was not the same as the one we sent. This is not done to go after your money - case has been filed and PayPal will decide the outcome. I am giving you hard facts showing that you incorrectly accused and penalized (by means of negative review) someone who discovered, stated and explained a problem. Feel right if you will...it won't hurt us, nor will your negative review. Do whatever you want, just know you are doing harm to someone who does not deserve it..and luckily will not be affected by it. And here's screenshots of the transcribed eBay communication...if you want more refer to eBay, this serves as our permission to give that communication thread to anyone who requests it, including judges, AGs, just everyone! I write this post for all those customer whose packages are being delayed and they get back to us demanding to know why that is and asking us to get on the phone with USPS and figure it out. As you can see we've placed a search/trace request for some package back in July 2018. Since then about once every month we receive one of the above messages, ensuring us that "every effort is being made to locate" it. We have long forgotten what this is about, of course. We settled it with the buyer one way or another - honestly do not even remember how, but most of the time it would be in buyer's favor, although there are times when we may fight against that if, for example, our listing advises against using First Class and buyer still insists on the cheaper and less reliable, thus giving up their rights to object issues caused by USPS. So long story short, if we've sent you here it is because we want you to know how an average package tracing ends up when filed up with USPS. You can't move them. You can't impress them. It'll be easier to explain to average American why Trump's certain personal traits are devastating for the political moral in the country (while others may be beneficial - it is definitely not all black and white picture). So sorry folks, and please do not take it personal if USPS has delayed or lost your package or if you're an avid Trump supporter. 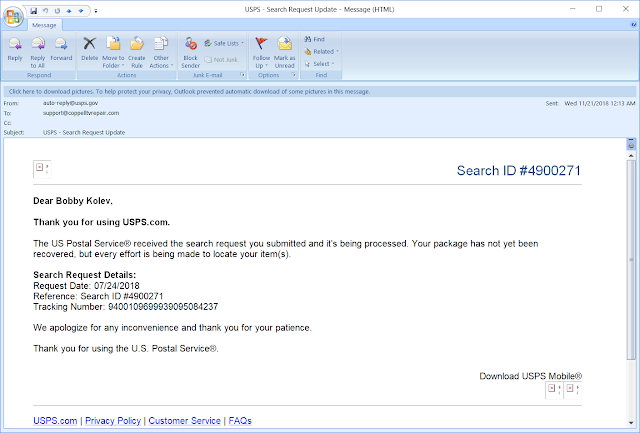 We do not have the slightest meaning to be attacking anyone, but facts speak for themselves - USPS sends useless messages for long obsolete search and Trump keeps instilling unethical behavior as a norm in the society. USPS also delivers lots of packages every day at a price better than any other carrier I know of. And Trump has some very spot on views on certain political and economical aspects, such Germany can't be treated as if it's post WW2 times and China can't be treated as if it's developing country anymore. Which is again to say it's not just black and white and we're not simply anti-USPS or anti-Trump. But where they lack they lack and it isn't up to us - or you for that matter - to change them at will. For good or bad it simply doesn't work that way. A customer called today asking why his 2-day USPS Priority shipping has not arrived yet. While researching the issue I came across the below details from their order. This is not a doctored image. It is a screenshot from Paypal's website order details. As you can see, according to PayPal we've shipped an order that was placed on October 23rd on October 22nd. We have many more than, of course, just like anyone on eBay where feedback ratio varies anywhere between 1:3 to 1:20 depending on your niche market, follow-up procedures, volume and what not. We also have seen companies come after us and reach that milestone way faster than us. We also have those (at the moment) 1.5% bad reviews of people who thought we were scammers, rip-offs etc - I've covered a few of those in previous topics already. Yet 10,000 public, independent positive reviews from all over the world, accumulated in the course of 10 or so years of operation are a clear vote of confidence and confirmation that we are getting something right. To us it is more than that, though. It is a proof that the world is still reasonable and sane, with people facing and resolving problems through communication and mutual work and not blames. Thanks to everyone who was part of that process!